Thank you Bill for helping a guy who knew nothing about investing in the stock market overcome his fears and do very well. My cumulative Total Return since beginning in February of 2011 to follow your recommendations is 46.1%. I am very pleased with the results and feel very comfortable following your investment strategy. How could I possibly need anything else? I have tried many methods of investment over the years and have had dismal results. Since following your directions, I have been amazed. In the year and a half, since I have been following your advice, our account is up 28%! In approximately 2 years, overall my retirement portfolio is up 40% and that does not include the reinvested dividends which is approx. another 7%, for close to 50% return. I'm enthusiastic about my investments that I have bought at Bill's recommendation, and am pleased with the weekly updates. I have recommended The Dividend Machine to family and friends due to the time taken to explain the "why" every time we are suggested "what" to buy.. I have had about a 20% gain this year. I wish I had known about this years ago! I have found this the most helpful newsletter ever. The first year I had a 12% gain between dividends and stock prices. Very happy with my results! I followed Bill's advice for the last two years and achieved double digit yearly gains plus dividends! I only had $4,000 to start with so I listened to Bill and diversified between the conservative, aggressive, and international; less than two years later I'm up more than 24%! In my first year of investing I am up 18.78%, and around 21.3% annualized. This beats the market gain by about 50%, and the compounding effect of the dividends has really not kicked in yet. So I'm happy so far. I have an average gain of 26.9% without considering dividends. I made enough the first year to pay off my Granddaughters house in 10 months only using the dividends paid back to me. I followed Bill's advice and got a 16% profit in 1 month. What I like best about The Dividend Machine is how sensible the recommendations are. My conservative portfolio is up 10% while the aggressive is up an impressive 28%! That doesn't include any dividends!!!! I am totally impressed!! After subscribing to many newsletters, this is the first one to actually show positive returns! The bottom line is that I made no money, and probably even lost a little, in the previous 10 years with a different newsletter. After starting with Bill, my investment account is up nicely and I have a nice flow of dividends coming in. Thank You and keep up the good work! I followed Bill's advice and buy all stocks he recommends . . . and I was using him against another advisor I had. (Bill's) advice won. Best newsletter I have ever seen. The Dividend Machine lets me be in control of my own destiny by relying on unbiased, expert advice. What I like best about the Dividend Machine is the peace of mind Bill's investment suggestions provide. In the immortal words of Ron Popeil, all I do is "set it and forget it!" My final retirement is not going to be anytime soon - but is 'guaranteed' by a dividend income stream above all else - that will grant my wife and children care free lives.ar. I am making money following a newsletter for the first time in over 25 years. What I like best about The Dividend Machine is the information is timely and easy to follow, Bill's "cookbook" is spot on! I followed Bill's advice to buy a number of stocks ... about 50% of my total portfolio ... and have done very well, exceeding the Dow and enjoying a regular stream of dividends which I re-invest. What I like best about The Dividend Machine is your philosophy on reinvesting dividends and stay for the long pull with good dividend growth companies. My Father never missed a dividend during the depression doing exactly what you are have recommended. Dividend Machine greatly improves my productivity, since I don't have to look at thousands of stocks, and diversification which takes hours and hours, I can rely on Dividend machine to help me narrow down good investments. I cannot thank Dividend machine for such incredible support and guidance. Stock recommendations are clearly explained in detail, regarding why the pick and why that particular price point. The stock reviews are also very helpful, especially for those picks that might take a while to mature. He also takes the opportunity to educate on the power of reinvesting dividends. Got my neighbor to subscribe. What I like best about the Dividend Machine is that it is very informative and, easy to read the newsletter and Bill keep us up to date on changes and stocks. The Dividend Machine is the best investment I ever had. It had provided me with unbiased fundamental truth about investment. I see great returns with a handful of stocks in my portfolio. What I like best about The Dividend Machine is the fact that Bill explain the reasons why he buys stocks, and also he's a good motivator, especially during pullbacks when you might be fearful. He teaches you to be greedy when others are fearful. The Dividend Machine is my go-to for investment information. I can feel comfortable that Bill has done the diligent work to make sure that not only am I buying into companies with a solid future but also that I am buying in at a good entry price. I am a busy professional and don't have a lot of time to do my own research - Bill does it for me. I have not found a record of steady increase of wealth to match yours. I am suggesting this to all of my family and friends. What I like best about The Dividend Machine is getting sound advice with the reasoning behind the advice spelled out. Also, the fact that the investing strategy is based on long-term gain, not overnight success. I owned most all of the stocks you recommended over the last two years and my portfolio is up over 30% in that time frame. What I like best about the Dividend Machine is it's track record and informative communications. 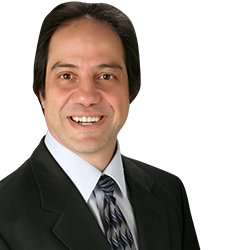 Bill Spetrino's picks are well thought out and his reasoning well-presented so, even though I know the final responsibility lies with me (and I do my own research accordingly) my confidence on Bill's suggestions is very high. I like that it's straight forward, clear, to the point and well researched. 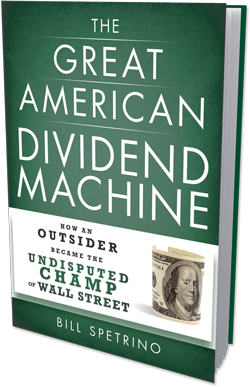 What I like best about the Dividend Machine is YOU! You're straightforward, easy to understand, decent, honest and I love your monthly newsletters! The Dividend Machine is our secret weapon and Bill's advice is excellent. What I like best about The Dividend Machine is the consistency and accuracy of the picks. What I like best about the Dividend Machine is that it is easy to read and understand. I am not a financial wizard and I appreciate the explanations and reasoning behind your stock picks. Clear common sense and consistent advise that is well researched and contrarian to Wall Street promoters. What I like best about The Dividend Machine is the writing style, layout and the frequent updates on previous recommendations. Bill's report is the best that I have read so far. What I like best about The Dividend Machine is Bill's personality coming thru - a practical blue collar kind of guy someone that I trust, believe in, & who knows what he is doing! Someone that I would enjoy sitting down with having a beer maybe a teaching moment about stocks or chat about baseball & Topps baseball cards. What I like best about The Dividend Machine is . . .your recommendations are straightforward and easy to follow. I particularly like that you give a price to buy in at. Your approach is one that makes me feel relatively comfortable. I love your analysis and the common sense approach. What I like best about the dividend machine is that it is put in terms that we can all understand & its very interesting. I appreciate the research he does and respect his advice. So far it's paying off and I know I couldn't have done as well on my own. Bill, you have the best of the financial newsletters of all, and I subscribe to many others than yours. I like your simplistic approach-getting good stocks with a recommended buy price. Very simple and I follow it. I like the Newsletter because it is written by an individual with personal experience. I also like the fact that Bill was recommending dividend stock before all the other newsletters and TV hucksters recognized the value of dividend stock. I've been using The DM for 2 years now and every time I have followed Bill's advice I'm batting 1.000, I have doubled my dividend income in the last 18 months. I consider you my personal friend and I trust your judgment. I do credit you with giving me valuable information on a stock that has the potential of becoming a solid growth stock that kicks out increasing dividends! What I like best about The Dividend Machine is . . . your honesty and tempered logical approach. Probably because of your insurance and accounting background. You aren't out to make a killing on every hot stock. I really like your method. I like your newsletter because it does not promise the world but it recommends very practical, and reliable information. I am a true fan, a believer in the Dividend Machine, and just being a part of it makes me very, very happy when I go to sleep at night. What I like about the Dividend Machine is that it focusses on dividend paying companies with "durable competitive advantage" like the type that Warren Buffet picks. What I like best about The Dividend Machine is it is informative and simple to follow with clear cut recommendations with buy "under" prices.